The university’s governing body and students’ union are not happy with the decision. 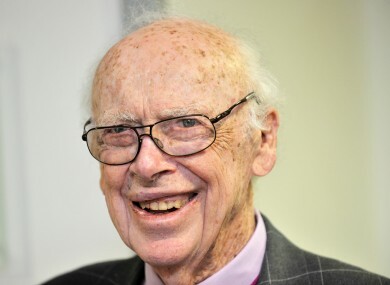 MEMBERS OF THE governing body of University College Cork (UCC) have criticised the decision to name a campus building after Professor James Watson. In a joint statement, Dr Angela Flynn and Dr Piaras Mac Éinrí said they want to formally disassociate themselves from the move. “Professor Watson is an eminent scientist who was awarded the Nobel Prize in 1962, with Professor Francis Crick, for describing the double helix structure of DNA. “However, he has been responsible for unfounded, unscientific and inaccurate statements of a racist and misogynistic nature. UCC Students’ Union expressed “shock and disappointment” at the decision by UCC management. In a letter sent to UCC President Dr Michael Murphy, Aidan Coffey, UCC Students’ Union President, stated that “a character who professed views regarding race, gender and sexuality so out of keeping with the standards and expectations of us in the university should not be recognised with one of the highest honours that this institution can confer”. A protest was held in the building yesterday. Watson has expressed some controversial views about minorities and women. In 2007, he told The Times he was “inherently gloomy about the prospect of Africa (because) all our social policies are based on the fact that their intelligence is the same as ours – whereas all the testing says not really”. He has also been critical of feminism and said that “it would be great” if all girls were pretty. “Dr James Watson is a scientist of world renown who is responsible for one of the most profound discoveries of the 20th century … We are acknowledging his scientific expertise. In naming this facility after Dr Watson we are building on his contribution to science and recognising his strong association with UCC as an honorary doctorate alumnus and scientific advisor to many UCC researchers. “Dr Watson’s grandmother was from Co Tipperary and he is proud of his Irish ancestry – his genome sequencing confirmed his dominant Irish genes. Email “Row over naming UCC building after professor who made 'racist and misogynistic' comments”. Feedback on “Row over naming UCC building after professor who made 'racist and misogynistic' comments”.